Feel free to share this button to link back to the challenge! This week, to avoid redundancy, I’m writing about the entire week as a whole, rather than updating you day-by-day. (You only have to hear “I hate my face” so many times before you’re OVER IT, am I right?) Let’s get to it. If I’m feeling a little sleepy, or I want a quick pick-me-up, I can splash some cold water on my face. I never understood why people did this in old-timey movies, but I get it now: it feels great! Try it, you’ll like it! 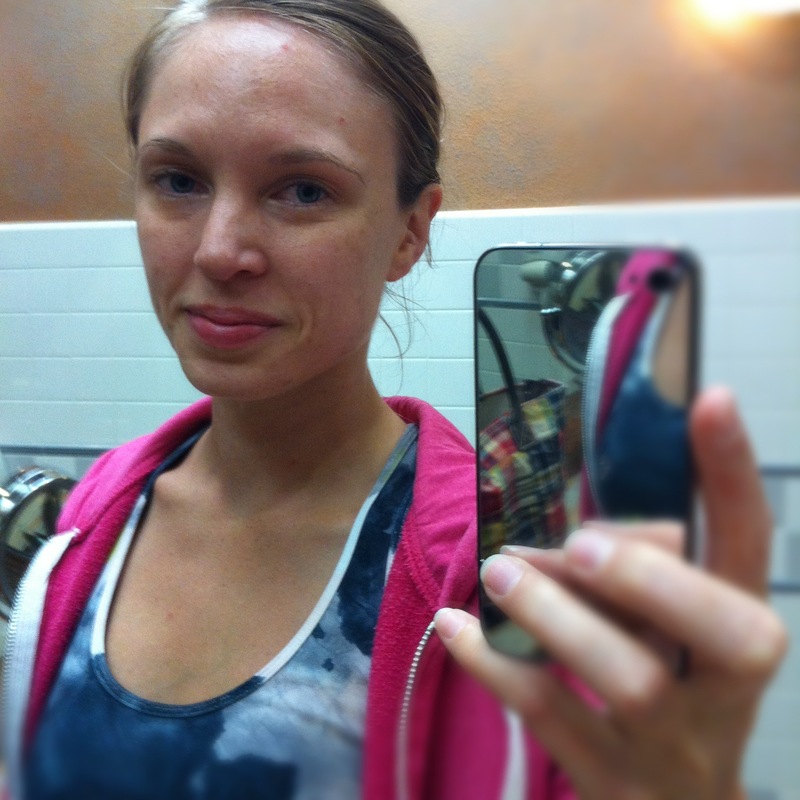 I can shower at the gym without having to lug all of my makeup along with me. I am ALL for packing lighter. Running into people I know when I’m oot and aboot. That last one is a bit of an exaggeration, actually. Lately, especially after I wash my face, or splash it with some cold water, I’m kind of liking what I see. Not like “hubba hubba, look at that foxy mama,” but more like “oh look at her, she looks sweet.” I think if I were to meet me, I would find my bareface kind and approachable. And I like that. There’s no graceful way to talk about one’s ugly traits, is there? If I try and dance around this, I’m basically trying to “put lipstick on a pig.” So here goes: I think makeup-Melissa felt (perhaps subconsciously) that she was in competition against every woman she met. Not necessarily in a mean way, but in a comparative way, for sure. Constantly measuring myself against others, to see how I stacked up. And why? Because I was letting my prettiness (or not-so-prettiness, depending) define a significant amount of my value. 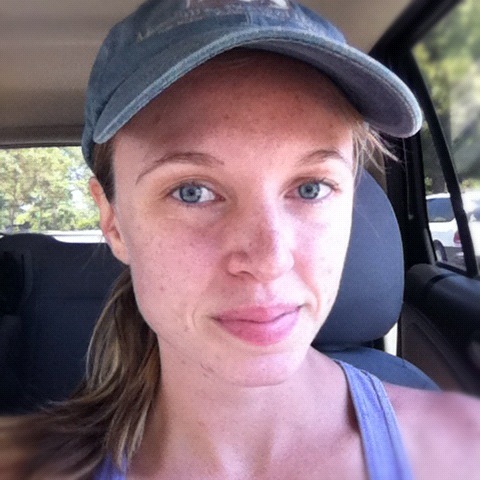 You’re probably thinking “no, duh.” But it took me TWO WEEKS of fasting from makeup to see this. Because I am stubborn. And sometimes slow to learn a lesson. The questions that I entered this fast with are being answered loud and clear, and I know this sounds strange, but I am really looking forward to the next two weeks of the fast. In case you’re considering participating in the fast yourself, it is never too late to start! Our Facebook group has more than 40 members now, and it has been awesome to read their posts, and commiserate about our barefacedness. There are some AWESOME ladies in the group, and the more the merrier! 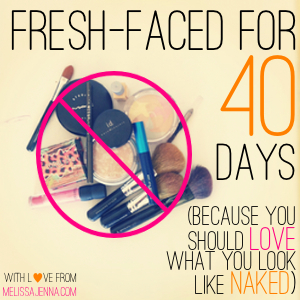 For details on the “Fresh-Faced for 40 Days” makeup fast, check out this post. If you’re interested in participating, join the Facebook group where we can keep each other updated on our progress, post links to our blog posts, and generally hold each other accountable. Obviously, we’ll all be starting on different days, so it’ll be fun to cheer each other on through the different stages. Also, feel free to use the button I’ve made (in the left sidebar, on the top) to link-back to the original post, so you don’t have to do all of the ‘splaining to your friends if you don’t want to. I love, love, LOVE the way you ‘talk’ in writing! I agree with everything that I have read. I am too old to care about how my looks may or may not impact another indivdual. It’s funny, but the older you get, the more your attitude tends to change to,” If you don’t like what you see, too bad!”! It IS very ‘FREEING’ if you know what I mean! I may just use some of your blog posts, if I may, to show 7th and 8th grade DYSLEXIC students – mine- what writing can sound, like this up coming school year! Julie, THANK YOU for the huge compliment. I’m flattered, and humbled. 🙂 Feel free to use whatever you want, and if you’d like something specific, let me know and I’d love to help you out. My husband is an English teacher, and I really enjoy helping out however I can. Hmm, that’s actually a really good idea. I’d love to expand on a lot of the concepts behind it, too. Thank you for getting the gears turning in my head! This is really really cool! I also just read your post in which you introduced the “fresh-faced for 40 days concept” and why you’re doing it. I really like how you emphasized that you LOVE makeup and it’s a GOOD thing, but you’re temporarily “fasting” from it because of how you’ve seen it affect you personally. So basically I don’t know anything about makeup or what other women think about it, so I really liked reading your perspective and how you’re so open and honest about it. We could spend a long time analyzing what this shows about our culture and sexism and women in “male-dominated fields”- it’s kind of messed-up. Don’t forget the part about being able to rub your eyes and not having to worry about smearing everything everywhere! 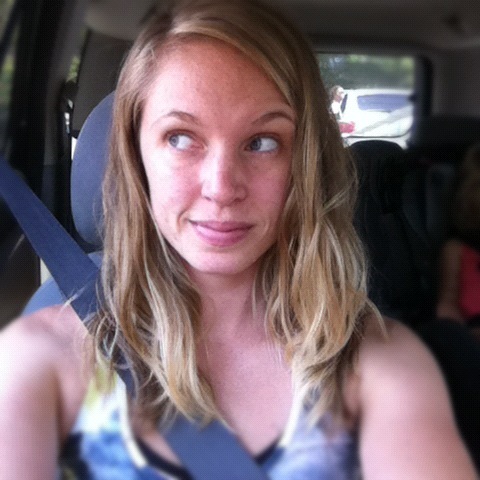 Make up free for almost 2 years and loving it! Two YEARS!? You are my hero. And yes, I love that I can rub my eyes, or my daughter can “smash” my face in her hands, and I don’t have to worry about my makeup looking funky afterwards. It’s really freeing. For me? That thing I need to cut out of my life? Smutty fan-fiction. Yeah. There I said it. This has been a real bugaboo for me but reading your post today made me go, “Ok, I hear You, Lord….I’m gonna obey.” Making that determination, that conscious decision to take down that little hidden idol in my life….I feel a weight being lifted. Jesus really is enough…closeness with Him really does satisfy! I spoke with my husband about this very topic last night, confessed to him and apologized for dishonoring him with this little addiction…then you said the above…. All I can do is marvel and thank God for the ways he shows His love for us. And thank you Melissa for allowing Him to use you for His kingdom. This makes me so happy. I’m sitting in my favorite coffee shop, getting teary over a blog comment! I love that you shared this, and it blessed me so much. 🙂 Thank you! 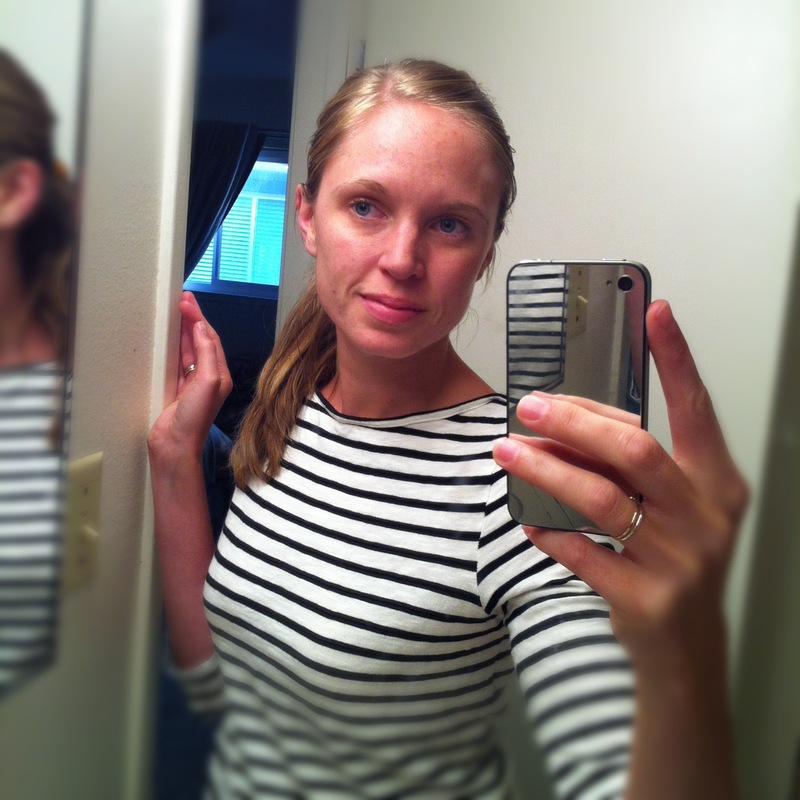 I came across this while going through your older posts and found your first couple comments about how little make-up you wore interesting in light of the fast – which I love by the way – I tend to go without make-up daily (really, nothing at all on my face) but do put it on for situations that sometimes I think, what is this for – like getting together with some of my closest and oldest friends….so I get the idea of the kind of sacrifice it can be and why you’re doing it, and commend you for it – just made me laugh to read what you wrote months ago – our perspective can change so fast! I found your blog because a friend said she recently found it and loves it. I love it too! I’ve been reading for about a half hour… catching up on this no makeup thing. 🙂 It always fascinates me when someone decides to go makeupless because I don’t wear it. I’ve only ever worn makeup twice. The first time was in college when a friend kept bugging me until I said ok. She put some makeup on me, I looked in the mirror and then I immediately ran to the bathroom to wash it off. All that said… I do understand the needing to cut something out of life in order to draw closer to God and all that. For me, that thing is sugar. I’m in month seven of a no sugar year. NOT EASY!! But, being in this far I can tell that things are changing. I am breaking the addiction and learning to run to God instead of food for comfort. I’m finding freedom. I hope you find freedom too! PS… my first view of you was with your naked face and I think you are absolutely gorgeous! And I’m looking forward to reading more about the journey. You look beautiful without makeup. If you color your hair at all, you will look even better when you get back to your virgin hair color as well. God gives us the hair color that looks best with our makeup-free faces. He’s smart like that 🙂 I’ve been makeup free completely for a year or so now, and don’t think I’ll ever go back. My skin is much happier and my life is much simpler 🙂 Keep up the good work. Stumbled across your blog when searching for “don’t wear makeup” or something like that in Google! I have been makeup free for some weeks now, actually at the insistence of my boyfriend who claims to prefer me barefaced. He claims he doesn’t notice the difference, except when (Hmmm, he’s thinking here for a while) “you don’t have those black circles around/ paint your eyes”… Thanks! I couldn’t have guessed my makeup application was so amateur! In truth, I always wore very nature makeup, though… of course, my eyes looks smaller without that beloved thickening, blackening mascara and subtle, defining eyeliner! I, too, felt like my vanity, and make-up crutch, was getting in the way of my relationship with God, and other people. Not 100% to the point of feeling as beautiful without makeup myself right now… but, I feel compelled to leave this comment after I saw the pictures you posted at the end. You are very beautiful! 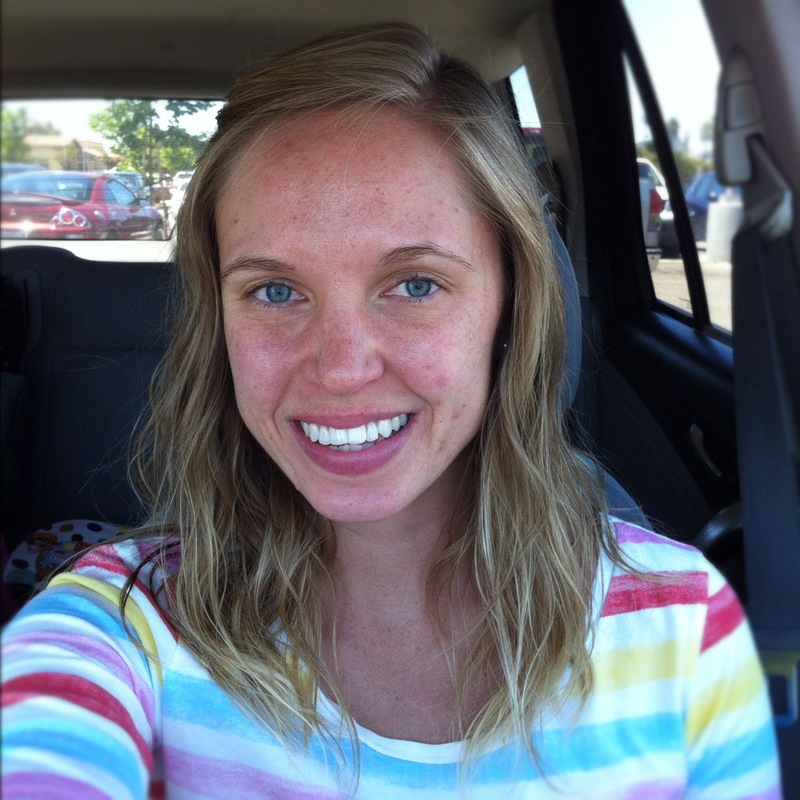 If I saw you out and about I would most definitely think so… And, no, I don’t think you need any makeup. Your face is radiant and lovely without it. It’s amazing how used to our made-up faces we can become. Going bare to me felt like relearning how to see my face. It’s not that I’m uglier… Just different! I am eagerly awaiting the next update on the makeup fast!